Skinless chicken breast fillets with smoked dry cure bacon, Cheddar and Red Leicester cheese and a smoky barbecue sauce. 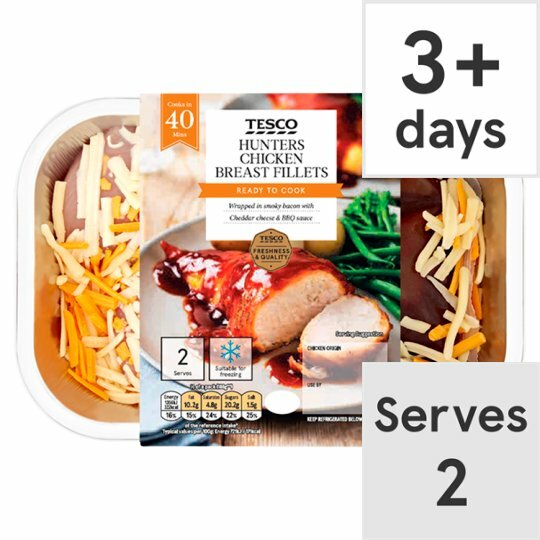 Chicken Breast Fillet (60%), Barbecue Sauce (25%), Smoked Dry Cure Streaky Bacon (6%), Cheddar Cheese (Milk), Red Leicester Cheese (with Colour: Annatto) (Milk), Potato Starch. Barbecue Sauce contains: Water, Sugar, Tomato Purée, White Wine Vinegar, Cornflour, Molasses, Salt, Onion, Soya Bean, Spirit Vinegar, Black Treacle, Garlic Purée, Smoked Paprika, Concentrated Lemon Juice, Tamarind, Onion Powder, Black Pepper, Garlic Powder, White Pepper, Pimento, Ginger, Paprika, Clove. Smoked Dry Cure Streaky Bacon contains: Pork Belly, Sea Salt, Sugar, Preservatives (Potassium Nitrate, Sodium Nitrite). Keep refrigerated below 4°C., Once opened, use immediately. Instructions: 190°C /Fan 170°C/Gas 5 35-40 mins Place foil tray on a baking tray in the centre of a pre-heated oven for 15 minutes. Add sauce from sachet and cook for a further 20-25 minutes. Stir sauce thoroughly before serving. This is natural occurrence and completely harmless. Defrost thoroughly for a minimum of 16 hours in the refrigerator. Follow the preparation guidelines opposite. Warning: Although every care has been taken to remove bones, some may remain.Caution: This product contains raw meat.Packaged in a protective atmosphere.